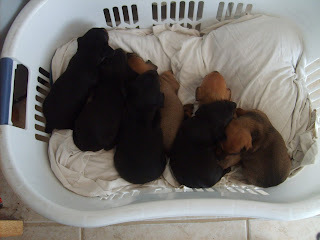 My dog Sophie had puppies back on December 29th - seven of them! The first month she was pregnant we thought she was just getting fat, but by the second month you could feel the tell-tale kick of little puppy feet. By the time she gave birth, her belly was just about dragging the ground. 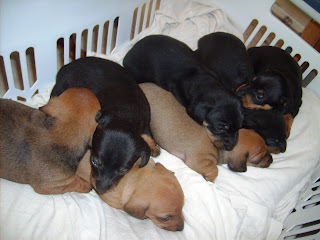 She's a mini-dachshund so her nursing puppies are getting so big they're almost swamping their poor momma. Aren't they cute? We're still not sure who he daddy is, but they look suspiciously a lot like our standard dachshund, Buford. Even though he's fixed, he got a lot of action when Sophie was in heat. Yes, dogs who are fixed can still do it. I just can't believe he fathered the pups! Anyway, they're all spoken for so far, so at least Sophie's foray into motherhood will make a lot of people happy. But this will definitely be the only batch of puppiness we'll be spreading around the world. Miss Sophie is getting fixed as soon as we can get her done. Well your article helped me terribly much in my college assignment. Hats incorrect to you send, wish look forward in the direction of more related articles in a jiffy as its sole of my favourite topic to read.